Proper airport security measures are crucial! Recently, airports have been vulnerable to security breaches resulting in deadly attacks. In fact, since airports are such large hubs of public places, they provide a massive target for any sort of security threat. As a result, since September 11, 2001, the federal government has made an effort to spend money and invest in providing better security measures in airports nationwide. However, airports still continue to be a massive security challenge. 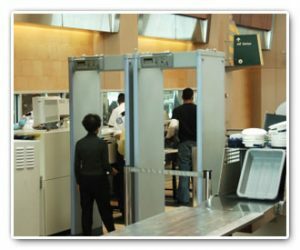 It’s safe to say that perimeter security is the first line of defense when it comes to airport security. In fact, one of the best place to stop intruders is within the perimeter of an airport. Recently, many airports have started installing secure fences around the facility to detract potential intruders from conducting any attacks. In addition to the fences put in place, airports install fiber optic sensors as an additional security measure to ward of terror threats or other attacks. Ideally, fencing should be done in three-foot deep trenches to detract would-be terrorists from digging their way into the airport. For the most part, airports are known for their large parking lots and garages. In fact, while these locations are not commonly thought of as terror targets, they are targets for other crimes such as sexual assault, theft, and burglaries. As a result, it behooves airports to invest in constructing airport emergency stations located outside the actual facility. Providing an immediate service that can access police is something that can protect innocent lives and thereby create a much more secure airport environment. Having built-in audio intercoms allows people to communicate with actual police personnel providing an incredible safety and security measure to keep patrons safe. Installing video surveillance cameras in and around airports is a wonderful way to create heightened security measures within airports. In fact, video monitoring is a game-changer when it comes to airport security. It provides security and safety for all airport patrons. This entry was posted on Thursday, June 29th, 2017 at 9:00 am. Both comments and pings are currently closed.